This project came about as I needed to measure how much power my Tricoder project was consuming so I could determine how long different batteries would last. I have used the INA219 in the past on a dual power supply that I build so I decided to give it a go on this project. The INA219 can measure voltage from 0 to 26 VDC and current from -3.2A to + 3.2A. This is a good fit for measuring the battery usage as the voltage is between 3.2 and 4.2 volts. The current being drawn will be less than 1.6 amps. The meter itself is powered over USB which also provides information to the PC through the serial interface. Data is transmitted once per second. The data may be imported into a spreadsheet program such as Excel or Numbers so that graphs may be drawn. The meter itself has a display for displaying various information such as the current voltage, current, and power consumption. It may also display the min and max values recorded. The cost of the project will be around $62 US but may be more or less depending on what you have on hand. If you need to purchase everything as shown in the list below, the total cost would be $104 US and you will have quite a bit in left over parts for your next project. Another way to save some money on this project is shopping around for some better prices or finding fewer sources for the parts. Just keep in mind that the more suppliers that you purchase from, the more in shipping costs you will incur which may wipe out any savings. The Nokia 5110 display is also available at Adafruit. The part number is 338. I had the Sparkfun unit already so that was the one I used for this project. The pinouts are different so you will need to be careful with hooking up the Adafruit unit as the pinouts do not match the order shown in the images in the Hardware Configuration section. The project uses a Teensy 3.1 but a Teensy 3.2 will work just fine. Actually any Teensy and even some Arduino boards should work as well. If you do use a different board, make sure that you verify that the pin assignments are correct. You may also need to modify the code to use the correct pins, particularly with the display. The Teensy is a bit overkill for this project so you may want to consider using a Arduino Micro however I see that the pricing for the Arduino Micro is more than the Teensy. You may also have to modify the program if it does not fit into the memory available. Sketch uses 49,492 bytes (18%) of program storage space. Maximum is 262,144 bytes. Global variables use 5,644 bytes (8%) of dynamic memory, leaving 59,892 bytes for local variables. Maximum is 65,536 bytes. 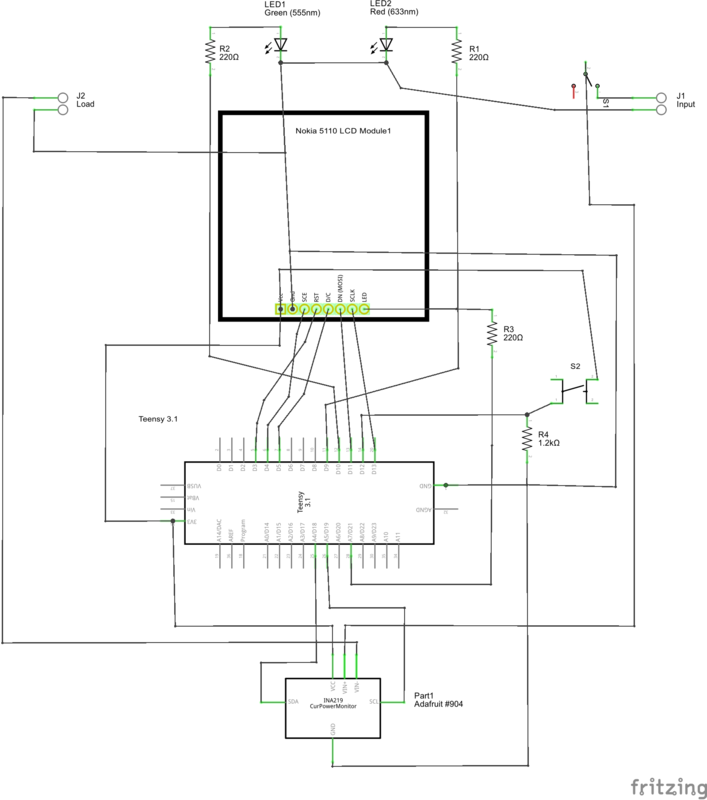 Below is a layout of the circuit which was done using Fritzing. Fritzing is free but I am not terribly skilled at using it yet so the schematic in the second image is not done well. 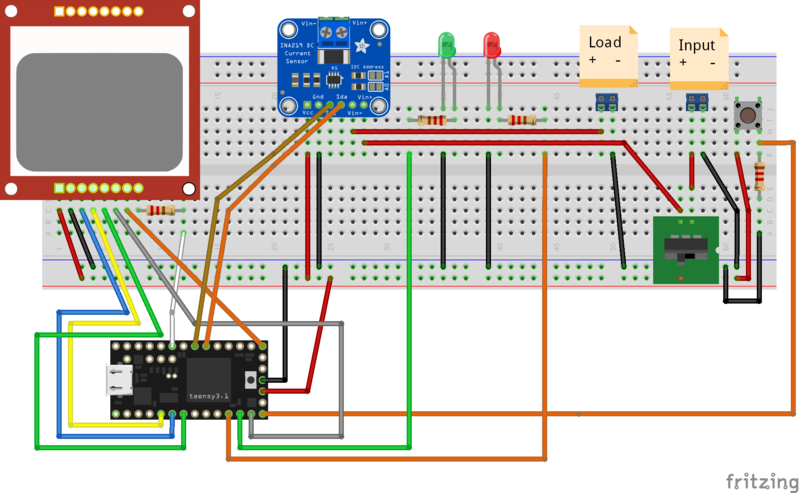 I have included the Fritzing project in the source code so you are free to modify it. Perhaps someone more skilled with Fritzing can make a better schematic and part for the Nokia display. For the project, I constructed it using two perfboards connected together with some male and female headers. The top perfboard contains the LCD, terminals, switches, and leds. The bottom perfboard holds the Teensy and the INA219. In order to verify that your wiring is correct, you should run some example programs for each piece of hardware connected to the Teensy. Each loop in the code, the values are summed together. The code then looks at the last time the display was updated and if at least one second has passed then the average for each is calculated, the sums and count are reset to zero, and the display is updated. Along with the averages for the three measurements, several other values are calculated. Time is the interval of time that the average watts was calculated. It approximates the chunk of area under the curve. DISCLAIMER: I am not a fan of how the unit is working from a usability standpoint. I made use of a single push-button to do four types of actions. In order to allow switching displays, changing menu items, selecting a menu item, and turning the back-light on and off, I ended up with something which is not intuitive or easy to use. If you can think of a better behavior to accomplish the same thing, please let me know. Unfortunately the voltages can be a bit confusing to understand as you may think the names mean something else. This is my understanding of the voltages based on sample code and the Adafruit Learning System pages. Load Voltage: The total voltage drop seen by the source. 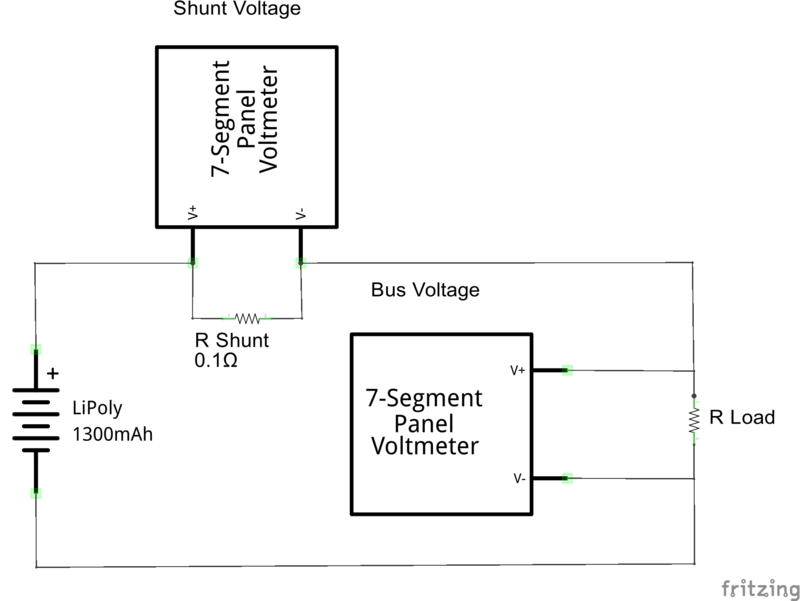 Load Voltage is the Bus Voltage plus the Shunt Voltage. The minimum and maximum values are taken for each reading not the averages. The code is reading the values every time in main loop so there are several reading per second. This is important to understand in the event that you look at the serial output and wonder why you do not see a reading that matches the min or max values displayed. NOTE: Reset options will cause the serial output to send several blank lines followed by a line of text containing the headers for the data. Here are a few changes that one may want to make. Change the way the menu options and button function.